This is made up of 19 female athletes, 16 male, fifteen of the combined total will be making their Island Games debut and 12 of the squad are still school pupils. Supplementing the squad will be two medical staff and two WIIGA management. 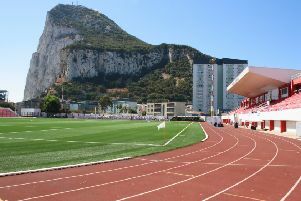 With Gibraltar unable to host the traditional sports of football – both mens and womens, golf or mountain biking, it means a much smaller squad than usual for WIIGA but within their ranks remain a core of hugely talented athletes keen to make their mark. The image of Heather Mackinnon leaping to a gold medal at her maiden games with her first jump of the competition will live long in all our memories and she will be determined to hang onto her title this summer. Alongside her in the athletics camp is multi-sport, multi-gong winning Eve Carrington. A veteran of EVERY Island Games the Western Isles have competed at and a winner of seven medals across five different sports, her experience is invaluable to the predominantly young squad who will miss Donnie Macleod and Eilidh Mackenzie from the track this time. The MacPhee sisters, who have bossed individual gold and silver medals in the mountain bike competitions at the last two games will not be in Gibrlatar either but another big medal favourite will be in swimmer Kara Hanlon. Kara, a winner of a remarkable hat-trick of gold medals in Gotland in 2017 has now competed in four previous Games, set Island Games records, wowed a nation and come within a whisker of adding a Commonwealth Games appearance to her ever-growing CV. In the swimming squad with Kara is her younger brother Matthew as well as Isla Budge and Katie Murray, who have all competed previously. They will be joined by two promising young swimmers in Sophie Smith and Mairi Maclennan. Switching focus to shooting and the squad warmly welcome Donald Macinnes back into the team and he will be joined by Iain ‘Lava’ Macleod from the Harris Gun Club, competing for the first time. The team will be hoping to add to Donald Walker’s bronze medal in the ABT at Jersey 2015. Following some investment into badminton in recent years WIIGA are delighted to be taking a full six person team to the Games for the first time. Included in the team is Beth Macphail, one of the growing numbers of young players throughout the islands, particularly from Barra and Lewis. And there is a first in the cycling team where Kevin Smith will be representing WIIGA for the first time in the road events.